Our Basic Electrical Engineering Tests allow you to experience an online examination in the real-time environment. In every online test on Basic Electrical Engineering, you will be presented with Multiple Choice Questions (MCQs) which will test your skills in Basic Electrical Engineering Concepts in a detailed and comprehensive manner. In the test, each question will have 4 options to choose from. You should select only 1 correct option as an answer and then move on to the next question. Once you submit answers to all the questions, you will be given your final test score. In the Online Basic Electrical Engineering Test, for every correct answer, you will be given 2 points. There will also be negative marking of -1 for every wrong answer. So, you will have to be more careful in choosing the answers to the question in your online examination. If needed, you should skip to the next question and come back to the previous question later so that you can do proper time management for the online mock tests. 1. "Basic Electrical Engineering Practice Tests" - In Basic Electrical Engineering practice tests, there will be a series of practice tests wherein you can test your Basic Electrical Engineering concepts on every chapter separately. There will not be any time limit on these tests. So, Basic Electrical Engineering Practice Tests should be the first set of tests which you should attempt. Goto these practice tests here. 2. "Basic Electrical Engineering Mock Tests" - In Basic Electrical Engineering mock tests, there will be a series of mock tests wherein you can test your Basic Electrical Engineering concepts on every chapter separately, but there will be a fixed time limit per test. So, it is similar to Basic Electrical Engineering Practice Tests, but with an added constraint of time limits. 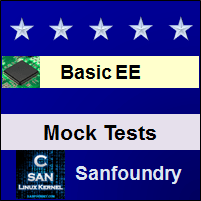 You should try Basic Electrical Engineering Mock Tests if you are appearing for any online examination soon. Goto these mock tests here. 3. 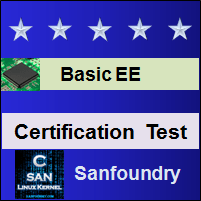 "Basic Electrical Engineering Certification Test" - Once you are through with your Basic Electrical Engineering concepts, then you should try our Basic Electrical Engineering Certification Test wherein Sanfoundry will issue a free Certificate to you if you scored either Grade A* or Grade A in Basic Electrical Engineering Certification Test. Goto Basic Electrical Engineering Certification test here. 4. 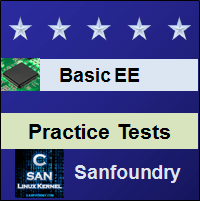 "Basic Electrical Engineering Internship Test" - If you are interested to do Internships in Basic Electrical Engineering at Sanfoundry, then you must take our Basic Electrical Engineering Internship Test. If you scored either Grade A* or Grade A in Basic Electrical Engineering Internship Test, then you are eligible for Internship at Sanfoundry in Basic Electrical Engineering. Goto Basic Electrical Engineering Internship test here. 5. "Basic Electrical Engineering Job Test" - If you are a fresher, a dropout, an experienced person and if you know Basic Electrical Engineering well and looking out for jobs in Basic Electrical Engineering domain at Sanfoundry (or our Network of Companies), then you should try and qualify our "Basic Electrical Engineering Job Test". 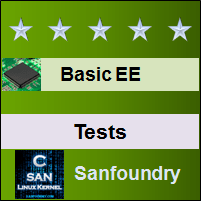 If you scored either Grade A* or Grade A in Basic Electrical Engineering Job Test, then you are eligible for a Job at Sanfoundry (or our Network) in Basic Electrical Engineering domain. Goto Basic Electrical Engineering Job test here. For every "Basic Electrical Engineering Practice Test", Total Questions: 20, Total Time: Unlimited. For every "Basic Electrical Engineering Mock Test", Total Questions: 20, Total Time: 20 Minutes. For "Basic Electrical Engineering Certification Test", Total Questions: 50, Total Time: 1 hour. For "Basic Electrical Engineering Internship Test", Total Questions: 50, Total Time: 1 hour. For "Basic Electrical Engineering Job Test", Total Questions: 50, Total Time: 1 hour. Before you get started on these series of online tests on Basic Electrical Engineering, you should learn, study and practice our collection of 1000 MCQs (Multiple Choice Questions and Answers) on Basic Electrical Engineering here. We also prefer that you should practice Basic Electrical Engineering practice tests and mock tests completely before attempting the certification test. Here is the list of online practice tests and mock tests on Basic Electrical Engineering. Each online test focuses on a "Specific chapter of Basic Electrical Engineering". So, you should try both practice test and mock test on every chapter to do a self-assessment of your knowledge (along with time-limit constraints) in every area or sub-topic of Basic Electrical Engineering. Basic Electrical Engineering Certification test, Internship test, and Job Test are mentioned at the end of this list. 1. Basic Electrical Engineering Test 1 – This set of online test on “Basic Electrical Engineering” tests your skills on Series Circuits, Parallel Networks, Series Circuits and Parallel Networks, Kirchhoff's Current Law, Kirchhoff's Voltage Law, Power, Energy, Resistivity, Temperature Coefficient of Resistance. 2. Basic Electrical Engineering Test 2 – This set of online test on “Basic Electrical Engineering” tests your skills on Kirchhoff's Laws and Network Solutions, Mesh Analysis, Nodal Analysis, Superposition Theorem, Thevenin's Theorem, Norton's Theorem, Source Transformations, Delta Star Transformation. 3. Basic Electrical Engineering Test 3 – This set of online test on “Basic Electrical Engineering” tests your skills on Star Delta Transformation, Maximum Power Transfer, Capacitors, Charge and Voltage, Capacitance, Capacitors in Parallel, Capacitors in Series, Distribution of Voltage Across Capacitors in Series, Capacitance and the Capacitor. 4. Basic Electrical Engineering Test 4 – This set of online test on “Basic Electrical Engineering” tests your skills on Electric Fields, Electric Field Strength and Electric Flux Density, Relative Permittivity, Capacitance of a Multi Plate Capacitor, Composite Dielectric Capacitor, Charging and Discharging Currents, Growth and Decay, Discharge of a Capacitor Through a Resistor, Transients in CR Networks. 5. Basic Electrical Engineering Test 5 – This set of online test on “Basic Electrical Engineering” tests your skills on Energy Stored in a Charged Capacitor, Force of Attraction Between Oppositely Charged Plates, Dielectric Strength, Leakage and Conduction Currents in Capacitors, Displacement Current in a Dielectric, Types of Capacitor and Capacitance, Magnetic Field, Direction of Magnetic Field, Characteristics of Lines of Magnetic Flux. 6. Basic Electrical Engineering Test 6 – This set of online test on “Basic Electrical Engineering” tests your skills on Magnetic Field Due to an Electric Current, Magnetic Field of a Solenoid, Force on a Current Carrying Conductor, Force Determination, Electromagnetic Induction, Direction of Induced EMF, Magnitude of the Generated or Induced EMF, Magnetomotive Force and Magnetic Field Strength, Permeability of Free Space or Magnetic Constant, Relative Permeability. 7. Basic Electrical Engineering Test 7 – This set of online test on “Basic Electrical Engineering” tests your skills on Reluctance, Ohmâ€™s Law for a Magnetic Circuit, Determination of the B/H Characteristic, Inductive and Non-Inductive Circuits, Inductance in Terms of Flux Linkages Per Ampere, Factors Determining the Inductance of a Coil, Ferromagnetic Cored Inductor in a DC Circuit, Growth in an Inductive Circuit, Analysis of Growth & Decay. 8. Basic Electrical Engineering Test 8 – This set of online test on “Basic Electrical Engineering” tests your skills on Transients in LR Networks, Energy Stored in an Inductor, Mutual Inductance, Coupling Coefficient, Coils Connected in Series, Generation of an Alternating EMF, Waveform Terms and Definitions, Relationship between Frequency, Speed and Number of Pole Pairs, Average and RMS Values of an Alternating Current. 9. Basic Electrical Engineering Test 9 – This set of online test on “Basic Electrical Engineering” tests your skills on Average and RMS Values of Sinusoidal & Non-Sinusoidal Currents and Voltages, Representation of an Alternating Quantity by a Phasor, Phasor Diagrams Drawn with RMS Values Instead of Maximum Values, Alternating Current in a Resistive & Inductive Circuit, Mechanical Analogy, Current and Voltage in an Inductive Circuit, Resistance and Inductance in Series, Alternating Current in a Capacitive Circuit, Current and Voltage in a Capacitive Circuit, Resistance and Capacitance in Series, Alternating Current in an RLC Circuit, Kirchhoffâ€™s Laws and Network Solution. 10. Basic Electrical Engineering Test 10 – This set of online test on “Basic Electrical Engineering” tests your skills on Frequency Variation in a Series RLC Circuit, Quality Factor, Oscillation of Energy at Resonance, Bandwidth, Selectivity, Voltages in a Series RLC Circuit, The Current in a Series RLC Circuit, Basic AC Parallel Circuits, Simple Parallel Circuits, Parallel Impedance Circuits. 11. Basic Electrical Engineering Certification Test - This set of online free certification test on "Basic Electrical Engineering" tests your skills on all areas (all chapters, topics and subtopics) of Basic Electrical Engineering. 12. 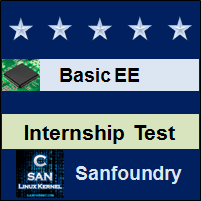 Basic Electrical Engineering Internship Test - If you scored either Grade A* or Grade A in our Basic Electrical Engineering Internship Test, then you can apply for Internship at Sanfoundry in Basic Electrical Engineering. 13. 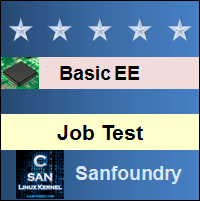 Basic Electrical Engineering Job Test - If you scored either Grade A* or Grade A in our Basic Electrical Engineering Job Test, then you can apply for Jobs at Sanfoundry in Basic Electrical Engineering domain. Best Wishes for your Basic Electrical Engineering Tests!